My friends told me about a theatre on the outskirts of London called ‘Astley’s Amphitheatre’, which opens in the spring, and where one can watch horses dancing. I went there with Sir Gore Ouseley. The theatre is somewhat smaller than the others I have seen and described in this journal. I will describe the performance of one of the nimble riders who stood on a horse’s back, without holding the reins, while the horse continued to run around the circular arena. Sometimes he jumped down to the ground and back up again; sometimes he stood on one foot, or lay down, or stood on his head with his legs in the air; sometimes he would vault himself from one side of the horse to the other; or, grasping the horse’s body with his legs, he would hang underneath with his hands trailing on the ground. Then a second horse was brought in to run alongside the first. The rider jumped back and forth from one horse to the other, dancing and clapping his hands. A third horse was added and he continued dancing. Most amazing of all was his feat of jumping from one side to the other over all three horses! The owner of the theatre was a friendly man; he explained to me how the horses are trained to perform these tricks. My Iranian servants were amazed and astonished by what they had seen. As we left the theatre, I told Sir Gore Ouseley I thought the horses performed so well that it should be called the ‘Horse Opera’. Comments: Mirza Abul Hassan Khan, or Mirza Abolhassan Khan Ilchi (1776-1845) was an Iranian ambassador who headed a diplomatic mission to Great Britain in 1809-1810. 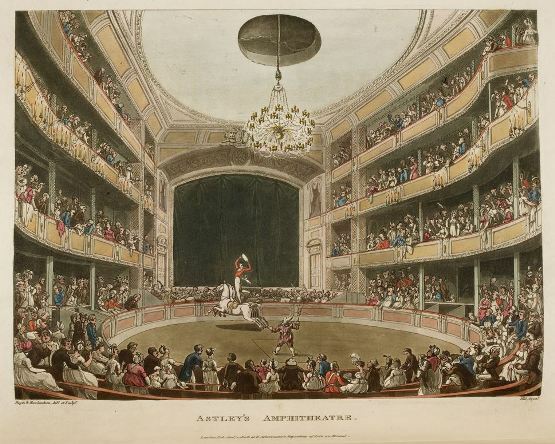 Astley’s Amphitheatre was originally a circus (opened 1770), but later put on pantomimes and other such entertainments. It was located by Westminster Bridge and had burned down twice before it became famous in the 1800s for its equestrian spectaculars, such as seen by Mirza Abul Hassan Khan.